I’ve been a big fan of Andy Stanley. Andy’s calling to build godly, Christ-centered leaders has inspired me discover, leverage, and embrace my leadership calling as well. As you know, Andy is the senior pastor of North Point Community Church and founder of North Point Ministries. 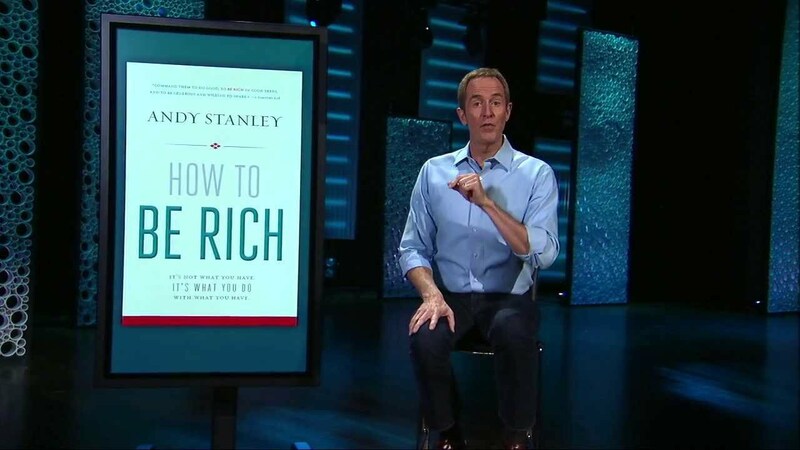 Brad Lomenick interviewed Andy on his latest book How to Be Rich. His interview was so good that I wanted to share it with you on this post. I believe you’ll enjoy his insights on the topics including, generosity, wealth, finances, and stewardship. 1) You talk about how almost everyone who reads this book will be rich in comparison to the rest of the world, but given that many people are legitimately struggling in America these days, is there a risk in overstating how “rich” much of the country actually is, despite being the largest economy? Andy: First, if you are able to buy, or consider buying, my book with your own money, you are much further ahead of the financial game than you might imagine. And even if you cannot, at some point in your life, you might be at that point. However, I am convinced that many of us get caught in the trap of thinking we aren’t rich by playing the comparison game. In our minds, rich is always the other person, the other family. Rich is having more than you currently have. If that is the case, you can be rich and not feel it. You can be rich and not know it. And that is a problem. That’s why I wrote this book. We know a lot of people who are rich, but know far fewer people who are good at being rich. So, whether you are rich now, or one day your turn out to be, I’d like you to know how to be rich. That is why I feel everyone needs this book. 2) In your opinion, has the evangelical church in America failed to see the strong connection between how we spend our money and our spiritual lives? If so, why? Andy: I think the connection many of us have failed to see is where trusting in our money leads us. The apostle Paul warned his protégé Timothy about a tendency for rich people: a natural inclination for your hope to migrate to money. And if you fall into this trap, the wealthier you get, the more you will hope in riches. Rich people have the potential to reach a point where they see money as the source of their safety and security. The way to offset this side effect of wealth is to put our hope in God. We’ve all met people like this. There are some rich people who, no matter how much God sends their way, never seem to put their hope in their riches. An amazing thing can be observed within this group of rich people. Since their hope is in the Lord, they never seem to suffer from another side effect of wealth that Paul mentions: arrogance. Despite being rich, they’re humble and generous at heart. So where we place our hope and trust is a pretty good indicator of our spiritual life. Where is your hope – God, or money? 3) Jesus begins his ministry by proclaiming good news to the poor, but is your sense that Jesus’ advocacy for the poor and his suspicion of wealth (“it is easier for a camel to go through the eye of a needle than for a rich man to enter the kingdom of heaven”) is more difficult to preach in a society like the U.S.? Are these biblical themes of helping the poor, and the danger of wealth, “hidden in plain sight” for many? Andy: No matter where you stand on the economy, we live in the richest time of the richest nation in history. In fact, if you can read this interview, you’re automatically rich by global standards. And it’s not just because you can read and have access to books, but because you’ve been given individual freedom to do so, not to mention the time. So my purpose in writing this book is to help rich Jesus followers get better at being rich. Even if we’re not convinced we’re rich, we all probably hope to be. And should we ever admit that we have, in fact, crossed that imaginary line, I want us to be good at it. After all, most rich people aren’t. 4) Can you talk about how cultivating a life of generosity helps not just society but also the giver? What spiritual principles are at work when we give generously? Andy: No matter how rich or poor you might feel, right now is the time to be generous. As counterintuitive as it seems, generosity begins wherever you are. It is important to make generosity a priority. There’s a tendency to think that generosity is for when you have extra money, when you’re rich. And as I say in How to Be Rich, you probably don’t think you’re rich. And since you’re not rich, why would you give away what little you have? No matter how rich or poor you might feel, right now is the time to be generous. However, when you make giving a priority, something happens inside of you. Especially when it’s financially challenging to do so. It’s like you loosen your grip on a value system whose motto says, “Money is the key to life and happiness and safety.” In that split second, you reject that way of thinking for one that says, “My hope is not in riches but in him who richly provides.” And suddenly, your eyes begin to open to a value system that can’t be measured by dollars. In addition, generosity helps us cultivate awareness of things that really matter. Opportunities that make a real difference in the world. Things that matter to our heavenly Father. It takes no discipline or effort on our part to be made aware of what we don’t have but could have. But it takes initiative to become and remain aware of what other people don’t but should have. Generosity helps us make a concerted effort to keep the needs of others in the forefront of our thinking. Not for guilt’s sake, but for the sake of being good stewards of the resources we have been privileged to manage. 5) How does a church – or a person – make giving a way of life, and not just another book, sermon series, church fad or well-intentioned but short-lived spiritual diet? Andy: When you take everything Jesus taught about being generous and distill it down, three common themes emerge. There may be more than that, but these three ideas gives us a great picture of what it looks like to be generous and to make it habitual. Generosity won’t happen unless you make it a priority. The best way to make giving a priority is to make it the very first check you write every month. Before the mortgage. Before groceries or clothing. Before saving. Whatever the amount, do it first. The minute you deposit your paycheck. This not only ensures that you’ll guard it as a priority, but it’s a symbolic way of reminding you where your hope lies. Not only do we need to make generosity a priority, we need to base it off percentages. If you want to guard against the side effects of wealth, you can’t evaluate your giving in terms of dollars. Percentages give you a much better reflection of whether you have control of your money or your money has control of you. So what percentage should you give? I tell people to start with 10 percent because the Bible writers have a lot to say about the tithe, which means, “tenth.” For some people, that’s extremely uncomfortable. But so is a colonoscopy, and those save countless lives. It just depends on how badly you want to protect yourself from the side effects of wealth. Remember, it’s not just a way to be “good.” It’s a preventative. The most important thing is to start somewhere. Even if it’s just 1 percent. A third leverage point for lasting change in generosity is progressive giving. To be progressive simply means that over time you raise the percentage. As your financial situation changes throughout life, change your giving percentage along with it. When you make that initial adjustment to giving 10 percent, it soon becomes comfortable. And while financial comfort is generally a good thing, it can also make you more vulnerable to the side effects of wealth. If you’ve been giving the same percentage for most of your life, consider raising it. Life is not stagnant. It’s progressive in nature. And your giving should be progressive too. 6) Can you talk about how Western and American society – and possibly even the church itself – has encouraged a consumerist mentality that makes radical generosity a concept that many people will find especially difficult? Andy: Gallup conducted a poll to see how different socioeconomic groups defined “rich.” Not surprisingly, everybody had a different definition – and nobody thought he fit it. For each and every person, “rich” was roughly double the amount possessed by the person defining it. “Rich” is a moving target. No matter how much money we have or make, we will probably never consider ourselves rich. The biggest challenge facing rich people is that they’ve lost they‘re ability to recognize that they’re rich. We all feel we need more. Appetites have only one word in their vocabulary – MORE. Appetites are never fully and finally satisfied. Even after the most satisfying meal imaginable, we eventually find ourselves rummaging through the pantry for a snack. Appetites aren’t bad things. I believe God created them. I also believe sin distorted them. Appetites bring zest and passion to life. But they are terrible filters for making decisions. I don’t think it is an exaggeration to say that your responses to your appetites will determine the direction and quality of your life. So, while generosity may be the antidote for the dizzying effects of wealth, your appetite for more may function as an antidote against God-honoring generosity. Your appetite for more stuff, status, and security has the potential to quash your efforts to be generous. And that’s a problem. Sin encourages the consumerist mentality and generosity is the antidote. If you feed an appetite, it grows. Satisfying an appetite does not diminish it. It expands it. To diminish an appetite, you have to starve it. So, in the early days of marriage, when none of us have a lot of extra money to do extra things, we don’t do extra things. And we were content. We were forced to starve that appetite. But once our incomes and our purchasing power began to increase, we started feeding that ugly beast. In doing so, we gave up a slice of contentment. And so it goes. So, to answer the question, sin encourages the consumerist mentality and generosity is the antidote. 7) Is your teaching on this subject part of a bigger trend in American evangelicalism of increasingly preaching not just a message of personal conversion, but also a message of social renewal, one that had perhaps been, many years earlier, ceded to mainline or more theologically liberal churches but is now being reclaimed? Andy: I’m not a philanthropist. While I care about the poor, the issue of local or global poverty doesn’t keep me up at night. I’m concerned about the plight of children. But I’m not on a mission to get all the available orphans in the world adopted into Christian homes. Though, like you, I sure wish they could be. My passion, and a major reason I want to get this message into people’s hands, is my concern for the reputation and cultural positioning of the local church. I want people to help me reanchor the church to undeniable, mind-boggling, culture-shifting demonstration of compassion and generosity. Because, generosity was the hallmark of the early church. They did for those who could not do or would not do anything in return. That was new. That got people’s attention. Eventually, it shifted and shaped the moral conscience of the West. 8.) What sparked your interest in initially teaching on this topic? Andy: While this is a new publication for me, this is a not a new message for me. Every fall for the past seven years, I’ve stood in front of our Atlanta-area churches and told them they are a bunch of haves who act like have-nots and that God and I aren’t happy about it! Okay, that’s not exactly how I phrased it. But when it comes to this particular topic, I’ve been known to be uncomfortably bold. Our churches’ journey began with a message series I preached in 2007 entitled How to Be Rich. Two things prompted the series. First, our culture’s incessant messages about how to get rich when, in fact, most of us got rich a long time ago and nobody told us. Second, Paul’s instructions to Timothy regarding how rich Christians are to behave. After studying the passage, I was left with the realization that a lot of Christians are not very good at being rich. Then it dawned on me: Well of course they’re not! Nobody has taught them how! So for four weekends I navigated our congregation through the terms and conditions of Paul’s instructions to rich people. 9) Describe what happened with your congregations in Atlanta when you preached a sermon series on this very topic. How did a $1.5 million goal turn into more than $5 million raised? What kind of transformation did this have on the beneficiaries of the money, and also on the donors themselves – the members of your church? Andy: In the fall of 2012, I challenged our churches to give $1.5 million toward our Be Rich giving initiative. They gave $5.2 million. In a week. And we in turn gave 100% of it away. No shipping and handling costs. No overhead or operating expenses. No expensive vacations for the pastor and his family. We gave it all away. In addition, our congregants provided 34,000 volunteer hours to local charities that are volunteer dependent. And if that weren’t enough, we collected 20,332 Operation Christmas Child shoeboxes for Samaritan’s Purse – the largest collection they’ve ever received from a local church. I visited our international partner in San Salvador, La Casa de Mi Padre, a group home for children who can’t live with their families for a variety of heartbreaking reasons. The executive director picked us up from the airport and asked if we liked his truck. Before I could answer, he smiled and said, “It’s a Be Rich truck. Thank you.” While visiting the children’s home, I was introduced to their newest employee, a licensed marriage and family counselor, a position they desperately needed as they seek to reconnect children with their families. As we left her office, we were reminded by the executive director that she was only there because of Be Rich. 10) What would you like Christianity to be known for in the U.S., and what do you think it’s currently known for in America? How might this book play into that? Andy: Generosity changed the world once. What would happen if the church became known for inexplicable generosity once again? The generosity poured out by the members of our churches continues to overflow our community and extend around the world. They embody the brand of generosity we’re called to extend to others. Generosity continues to capture the attention of people from all over the world. To this day, it’s a reflection of the love Jesus demonstrated. It send a message to the world that God so loved that he gave – and there were no strings attached. The best ministry we can offer on God’s behalf isn’t to explain our theology. It’s to extend our generosity. Because that’s what our heavenly Father did for us. And that’s what he’s asked us to do as well.